Above you can see a picture that I shot weeks ago, it’s a gull. I used my 70-300mm Tamron lens and cropped the picture even further because I wanted people to pay attention to the head, mainly because I like the beautiful red/black beak. Apart from that, I generally like close-up shots because that allows us to see some details. It’s very easy to say that this bird is a gull, but if you are interested to find out what kind of gull it is, the identification can be tricky for beginning bird photographers. The thing is, black-headed gulls can either have a winter plumage or a summer plumage. As the name implies, the bird should have a black head, but that is only the case with the summer plumage. There are some other pitfalls during research, because they look different depending if they are adult or immature. 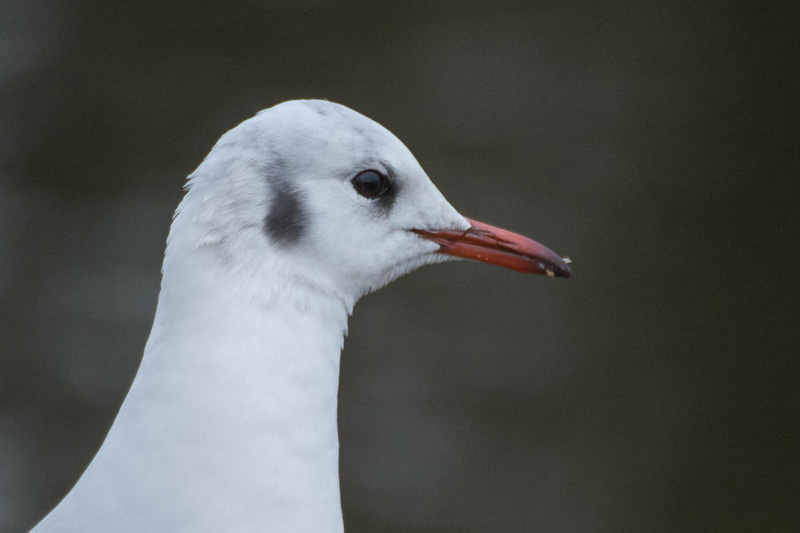 Immaure black-headed gulls don’t have a red beak but an orange beak and they also don’t have red feet. But then, the immature gulls have spotted wings as you can see in one of my other posts, adults don’t. So, what we see in the photo above is an adult black-headed gull in winter plumage, like you can see here too. When I started with photography, or when I started to take photos of birds, it was basically just about taking an interesting photo. But this changed over time, I am often very curious and want out what exact bird it is or why they sometimes look different. I really like to research these things, but on the other side that means I am much slower to upload all my bird photos to the blog, but that’s ok. You can find more photos of black-headed gulls on my blog. [ Smiles ] Now, that is one beautiful-looking bird!